Ice dam membranes do not prevent ice dam formations. 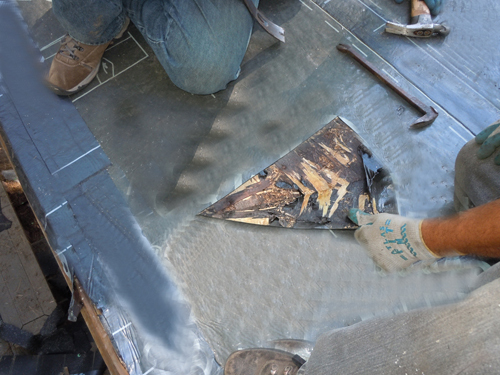 They are intended to help prevent leaks by sealing around the fasteners that attach the roofing. When an ice dam forms, the membrane is expected to seal against water intrusion. While membranes have assisted in ice dam leak prevention, an experienced contractor will tell you they are not 100% effective. After a recent heavy ice dam condition in our neighborhood, a major roofing supplier admitted there were failures experienced by every ice dam membrane manufacturer which they sold. Leaks moisture found under a membrane on a two year old roof. Many factors contribute to membrane failures. They range from improper installation of the membrane or roofing, faulty products, to the slightest movement of a shingle. Shingles displaced by ice movement can be easily replaced but often there is damage to the membrane seal around the nails, usually inaccessible and/or concealed. Although the membrane is designed to seal around the shank of the nail, the wire used to bind coil gun nails (commonly used to attach shingles) tears the membrane and prohibits a secure seal. This photo to the right shows where a two year old membrane failed and damaged a new vertical grain fir ceiling.